One of my favorite desserts to make is a trifle. They are so easy to make and you can pretty much wing it with the ingredients. I love cake trifle desserts because no matter what level of cake decorator you are… it’s almost impossible to mess up! This post has affiliate links which help support this site. 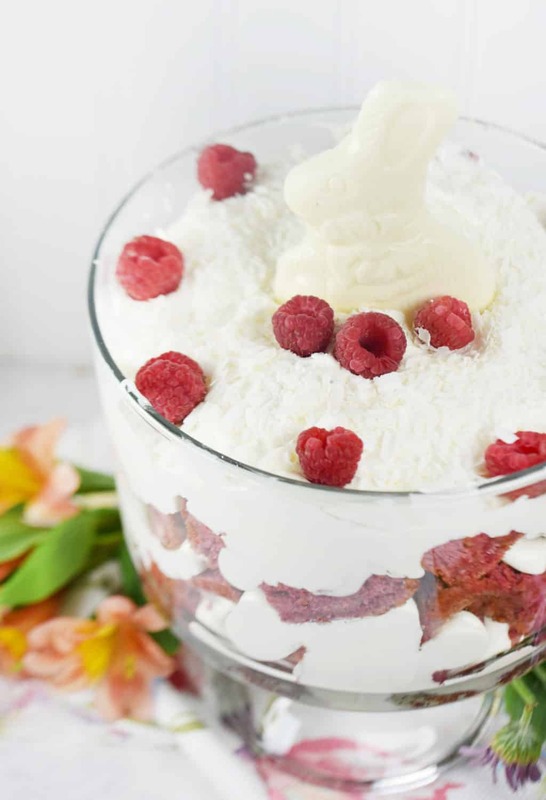 This White Chocolate Raspberry Bunny Fluff Trifle is so beautiful and easy to make. This would be perfect at any Easter meal and could be a beautiful centerpiece. 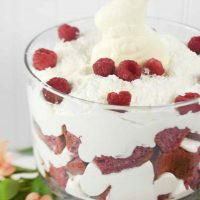 The raspberry cake is made using a can of raspberry filling and a cake mix! You only need to add eggs to the mix. My aunt taught me this method and what makes it really stand out is the taste. The taste of the real fruit really stands out! It doesn’t make a very even cake, though, so be sure to only use this method for cupcakes or a trifle. Make the cake according to the box, but instead of water and oil use the pie filling. Meanwhile make the creamy layer by mixing the pudding and heavy cream. Let the mixture thicken and then fold in the 1st cup of cool whip. Once the cake is finished baking let it cool and cut into small squares. 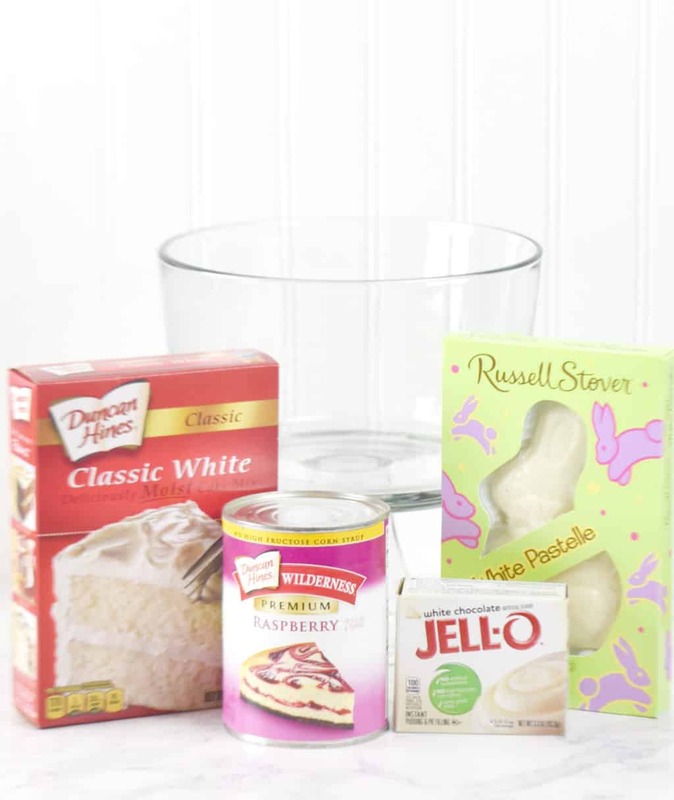 Layer the cake with the cool whip mixture until it reaches the top of the trifle bowl. 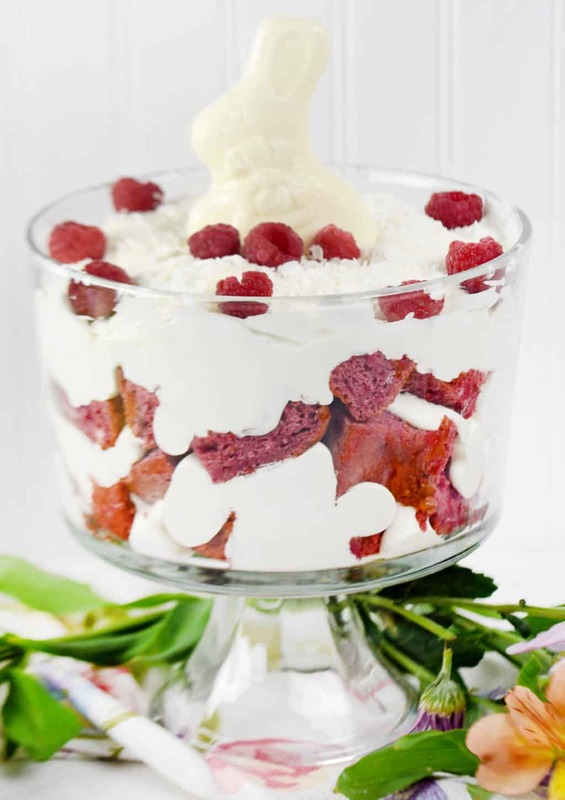 Add the white chocolate shavings, raspberries and the bunny! Enjoy! It’s a real Bunny Beauty! 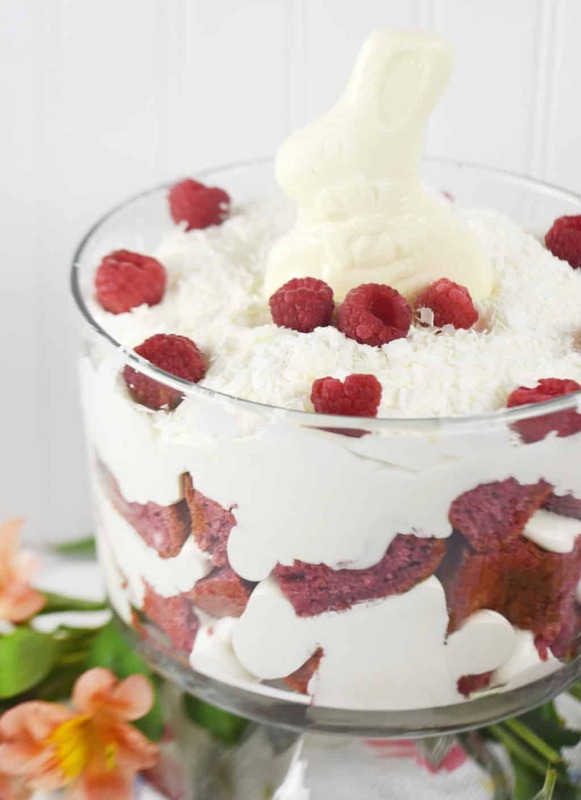 🙂 Of course this White Chocolate Raspberry Bunny Trifle could be used for any occasion, but we especially love it as Easter. Enjoy! How much ahead can you make this? Hi Renita! You can make this the night before… just make sure to refrigerate! We ate it a couple of days after making it and it was still great!